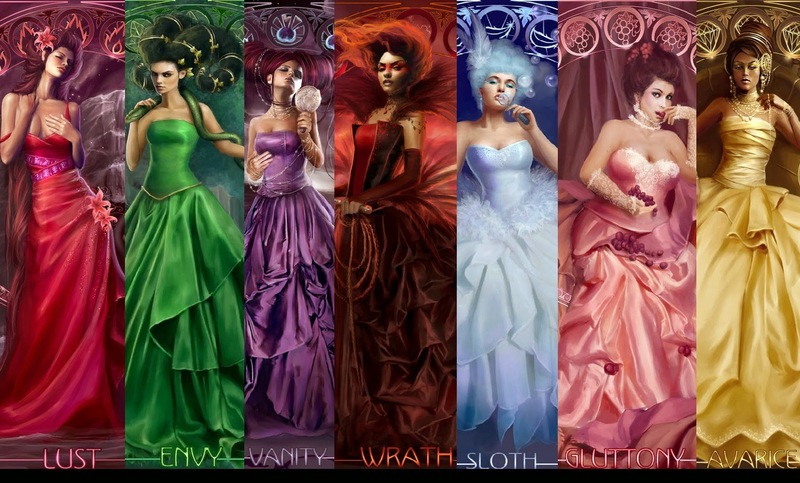 I've been tagged to do the Seven Deadly Sins Questionnaire (created by BookishlyMalyza) by the wonderful Micheline from Lunar Rainbows and because I love bookish questions - here are my answers :) Thanks for the tag, hun! 1. Greed. What's your most inexpensive book? What's your most expensive one? Hm... cheapest are probably my books from the 'Bücherbrocki' which is kind of liked a used books store. Paperbacks are only two bucks there, no matter how big or small they are. If you count ebooks though, it'd be one of my Amazon freebies or deals for 99 cents. 2. Wrath. What author do you have a love-hate relationship with? This is so hard! I know there is someone, I just know! I'm looking at my shelves and I just can't figure it out. Hm. Maybe Sarah Rees Brennan, but just a little. I mostly love love love her, but she has a way of ending books that is just plain cruel. Or Jane Austen. I know she's a good writer but god, most of her characters are just so aggravating! It always takes me forever to get into one of her books because I can't find a single person that I like. Which I know is not how I should look at books as an academic reader but it's just infuriating because she writes about the most horrible people and so many of her protagonists are either doormats (Anne, Fanny) or think they know it all (Emma). 3. Gluttony. What book have you devoured over and over again with no shame. I don't have time to re-read as much as I used to, but I've read Der Kreis der Dämmerung bei Ralf Isau about 3 times when I was a teen. Another frequent re-read were books by Wolfgang Hohlbein (German YA fantasy, mostly from the 80s and 90s): Der Greif, Spiegelzeit, Dreizehn... I think some of them have been translated to English. I've also read many of especially the first few Harry Potter books several times, as well as The Hobbit and The Lord of the Rings. These days though, I'm mostly a re-reader of poetry because you don't spend days on it and I find it calming to come back to my favorites. The ones I've read most are probably The Lovesong of J. Alfred Prufrock by T.S. Eliot and the poems in Stephen Crane's Black Riders and Other Lines (I always mean to re-read just a specific one and end up going through the whole book). I also love Ode to a Nightingale by Keats. 4. Sloth. What book have you neglected reading due to laziness? Well. About three years ago I bought a huge omnibus of Garth Nix's Abhorsen trilogy. All three books in one. But it has well over 1000 pages and it's HUGE and basically impossible to transport. And since I tend to read on the bus/train... somehow I just never read it. Even though I've wanted to for 10 years, since I first spotted Lirael at a local book store. 5. Pride. What book do you talk about most in order to sound like an intellectual reader? Well. If I wanted to show off or maybe purposefully make another person leave I'd talk about Ulysses by James Joyce. Or The Waste Land by T.S. Eliot. As for Classics I really enjoyed: Jane Eyre, The Picture of Dorian Gray, Tristram Shandy, Frankenstein, Mrs Dalloway, and The Private Memoirs and Confessions of a Justified Sinner (though that one was very disturbing). 6. Lust. What attributes do you find attractive in male or female characters? Male: I tend to go for the lean types rather than the bulky ones. Dark hair. Green or blue eyes. Snark and mischief mixed with vulnerability and a sense of humor. If he's creative or good with a sword, that's a plus. I can go for both a villainous or a morally upright guy, but no fake bad boys please. Female: I love fierce girls or women who can stand up for themselves, be it because they are badass fighters or good with words. Loyalty and compassion are also important. I like protagonists that are mostly self-reliant but also not too proud to ask for help when they need it. 7. Envy. What book would you most like to receive as a gift? Um. Any book on my TBR that I don't own yet? But a 19th century edition of Paradise Lost by Milton or the above-mentioned poetry volume by Stephen Crane would be wonderful. You know, old, rare books. Perhaps with engravings. I also like it when the previous owners have written into them - little notes, their name on the title page, or a dedication if the book has been a gift. This took me waaaay longer to write than I thought it would! Okay, time to tag some people! If you've already done it then I'm sorry, no time to check. Perhaps leave me a link to your post? YAY for expensive LotR books xD and re-reading Harry Potter books of course haha I so remember that story of yours about having to get that Swinburne poetry book restored, and it still stings to read/think about it! Oh and I really like your lust answers for guys and girls!! Discussion: How Do You Travel with Books?